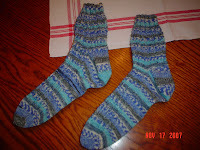 These are the socks I just finished for a sock swap. It was my first time knitting with Opal 6 ply yarn. This colorway is #1714. I really enjoyed using this yarn. the pattern is called Menehune Cobblestones. It was the first time I knit this pattern also. I think they turned out rather nice! I only have a little bit to do on the second sock and I will have them done! I am not as fancy as you are thought. I am making yours out of Maine wool...they are just plain, but they are so warm! They are the ones that are always asked for by family and friends..and the ones I always sell the most of! Hope you enjoy them as much as I will enjoy the ones youve made for me! !